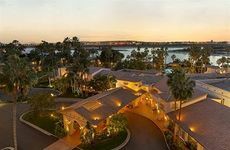 Find Hilton San Diego Resort & Spa deals, discounts and special offers. This Mission Bay resort features waterfront dining, Kids Kamp, tennis courts, full service spa and outdoor pool. In the heart of the gaslamp area, Hilton features relaxing pool, complimentary fitness center and casual dining. Beach-front Hyatt Regency has eco-friendly full-service spa, swimming pools with water slides, fitness center, & marina. Manchester Grand Hyatt has 1,625 guestrooms, full-service spa, dining, & fitness center on waterfront in downtown. Marriott has 1,362 luxuriously appointed guest rooms and features spa services, dining and full service marina. 511-room and suite Omni, across from Convention Center, has outdoor pool, ocean views and fine dining venues. Championship golf & spa Rancho Bernardo Inn has 287 rooms w. 42-inch flat-screen TVs. Smoke-free Marriott's 291 rooms and 15 suites offer stunning ocean views, beachfront access, fine and casual dining. Newly renovated, landmark US Grant has in-room spa services, fitness center, a luxurious pool, as well as art gallery. Chic, ultra-modern styled W features world-class spa, heated pool in downtown near the bay. With harbor and downtown San Diego views, Westgate features a full-service spa, fitnesss center, near gaslamp quarter. Westin Gaslamp features refreshing outdoor pool, in-room spa services and casual dining venues. This hotel is located in the trendy Gaslamp district of San Diego, CA. This smoke-free luxury hotel features upscale dining, fitness center, and a sushi bar.